I snapped some shots of species I noticed that I still have not been able to identify. Here are photos six of them. If anyone has a suggestion for the species of any of these, please let me know. Thanks. I believe this is in the genus Ipomopsis. It is similar to, but quite a bit more diminuitive than, Ipomopsis congesta congesta that I have seen to the northeast in southwestern Tooele County. My best guess is this is that taxon, also, despite the different morphology and the fact that here it grows 1,700 ft higher and in much less sunlight than Tooele County’s population that I know of. Here, this grows in mostly-shaded pinion-juniper, limestone-gravel habitat around 6,900 ft elevation, near Salvia dorrii, Penstemon eatonii, Penstemon humilis and Physaria chambersii. 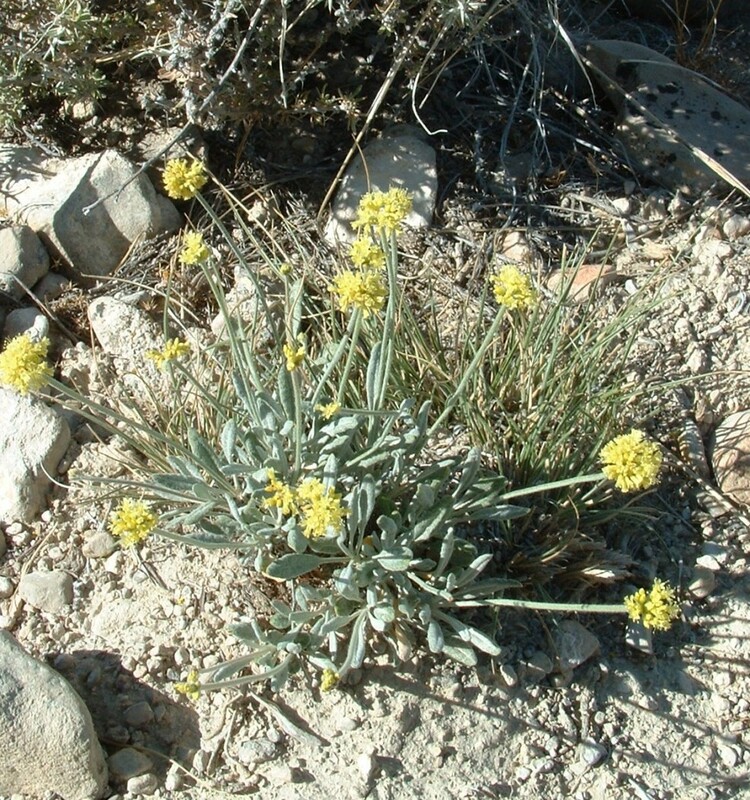 This is in the genus Eriogonum. Here some grows near 4,900 ft elevation, on a northwest-facing slope it shares with Tetradymia nuttallii and bunchgrasses and no other plants. 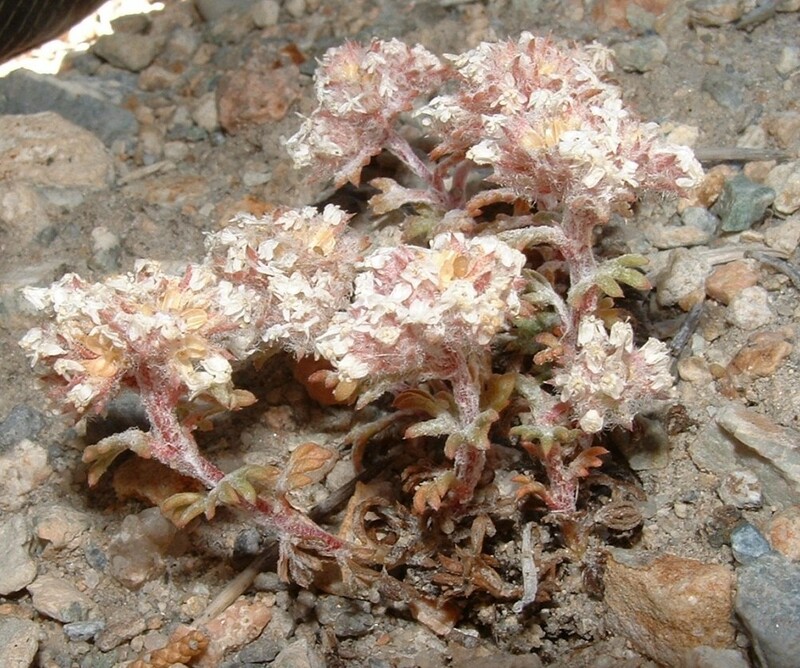 I have searched through the Eriogonum species that, according to the USU Utah Plants database, occur in this area or nearby, and then I have searched through the detailed species descriptions of those species in Welsh et al., but have come up with no clear answer. My best guess would be this is Eriogonum brevicaule, but with much tighter flowers than I have learned is routine for that species toward the east (Wasatch Mtns) and south (Canyon Mtns) of here. The USU database does show E. brevicaule occuring within the Cedar Mtns proper. This site is outside that range, although not very far away. 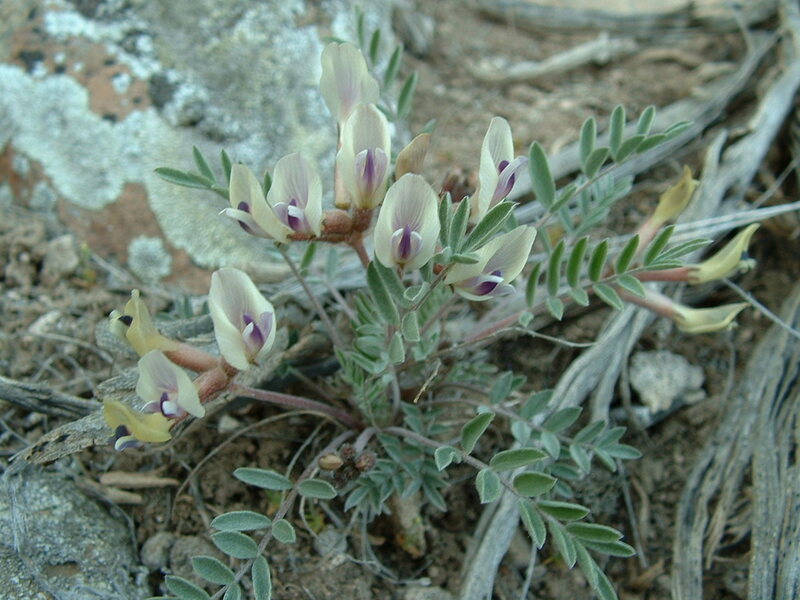 This is a species of Astragalus. Note how early its peak bloom season is. It looked to me as though there were at least four Astragalus species I encountered on this excursion. 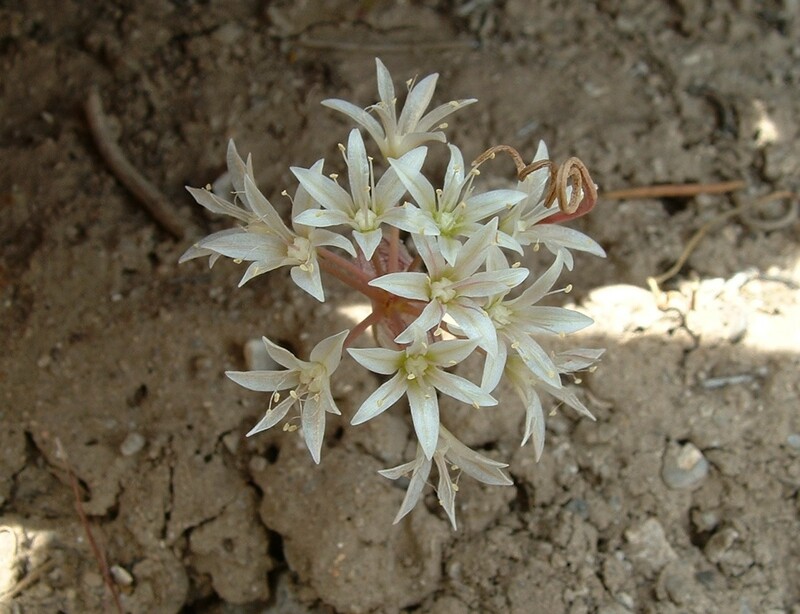 This species is the one that blooms earliest. Here it occurs in partially shaded pinion-juniper-big sagebrush habitat, near 5,300 ft elevation. This should not be hard to identify. At first I thought it was likely a parasitic plant, since I could see no green in it. But later I discovered another Great Basin plant without green at this time of year–Lewisia rediviva (bitter root)–that does show green leaves later in the season but not this early. So, this species could be like that? This occurs in partially shaded microhabitats on generally east-facing limestone slopes of arid pinion-juniper habitat. 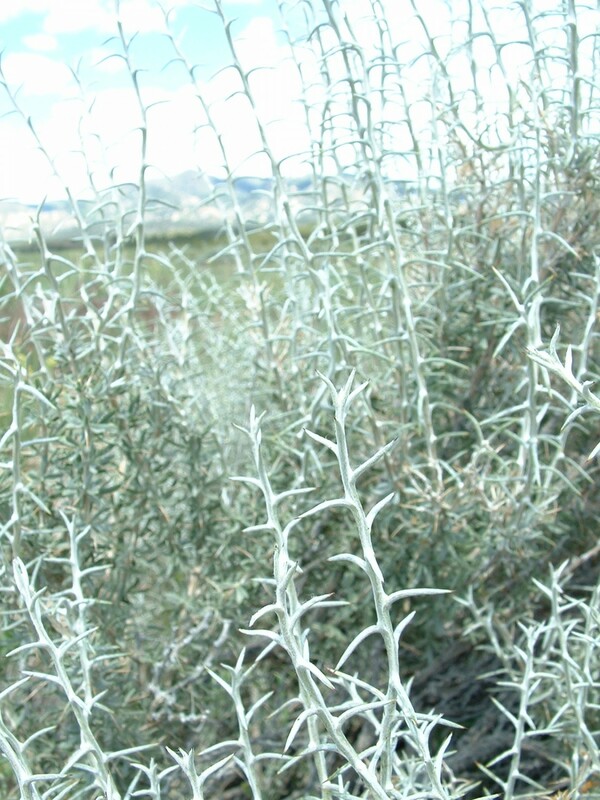 I noticed only one individual of this species here, close to 5,600 ft elevation, near Ephedra viridis, Ephedra nevadensis, Eriogonum ovalifolium and Atriplex canescens. When I took the photo I assumed it was one of Utah’s two spiny horsebrush species (Tetradymia nuttallii or T. spinosa), but later when I compared photos of those species I realized the spines of this plant do not match those of either of those horsebrushes. I wish I had searched for any leaves on this plant, & photographed those, but I did not. 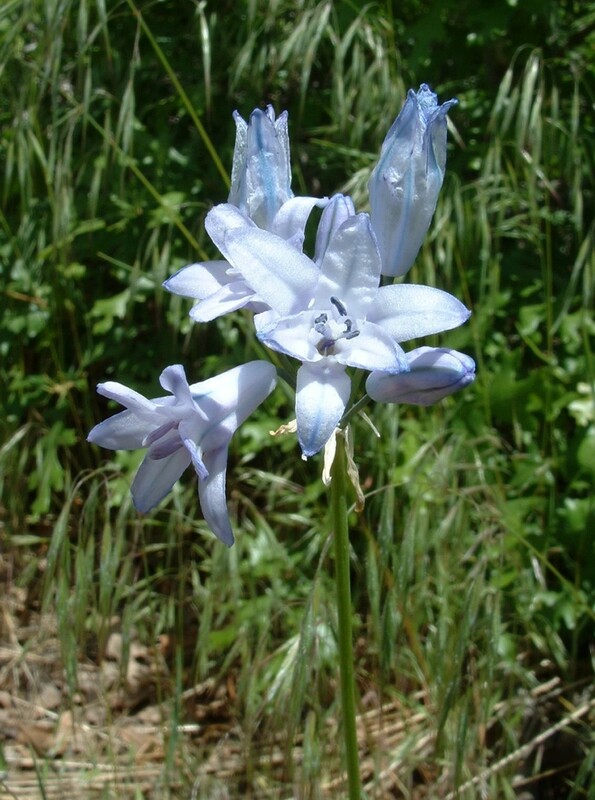 This species must have a fairly short bloom time, since I noticed it here in an area I have visited several times, but this was the only visit during which I noticed this pretty blue flower. I neglected to photograph the leaves. I have spent quite a bit of time in the Wasatch Mtns, but have not noticed this species before anywhere else in the Wasatch. Here, it grows at about 6,600 ft elevation, on a gentle southwest-facing slope, near Purshia tridentata, Artemisia tridentata, Cercocarpus montanus, Gutierrezia sarothrae, Quercus gambelii, Amelanchier sp., Alium sp., Cirsium sp., Opuntia “prickly pear” sp., and cheatgrass. If you have suggestions for the species of any of these six, please let me know. Thanks.